An artist's rendering of the future D and C building. 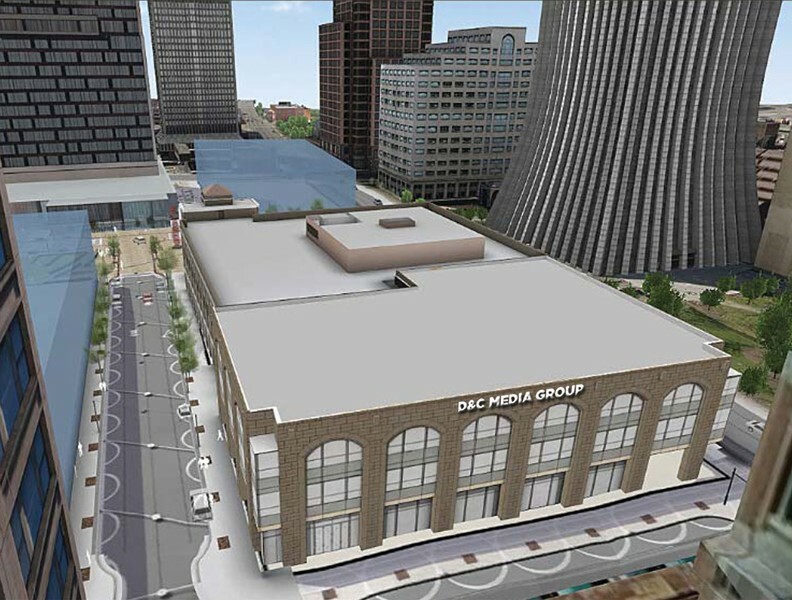 The Democrat and Chronicle will move into a new building at Main Street and Clinton Avenue on the Midtown site in downtown Rochester. Michael Kane, president and publisher of the Democrat and Chronicle Media Group, made the announcement today. "We are excited to start this new chapter in our growth and transformation as a local media company in a modern space," Kane said in a press release. A letter of intent has been signed for the site, which is adjacent to Windstream Communications. The D and C will lease approximately 42,000 square feet in the two-story building, which will house the company's news, advertising, marketing, digital strategy, and business operations. The company will maintain its production facility in Greece. No timeline has been announced for the move. The D and C is currently located in a historic building at 55 Exchange Boulevard. That building is on market for $3.5 million, according to the D and C's website. The move is not contingent on the sale.